Download banner PowerPoint templates and Keynote slides from SlideBazaar to develop presentations especially for the timeline, planning concepts. Banner PowerPoint templates are highly editable templates that give an opportunity for the user to customize according to their needs. These templates are an excellent choice for visualizing the concepts easily without any clutter. In business, it is necessary to adopt strategies that will erase out minor errors and creates a clear blueprint or a plan for smooth functioning. This can be achieved by using such banner templates. 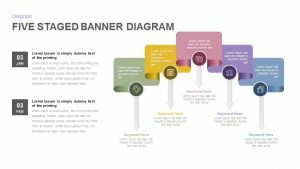 Banner templates are loaded with a creative and attractive banner like infographics to grasp the attention of the audience. These banner PowerPoint templates are an ideal choice for creating presentations related to milestones in a project. Every project involves milestone so that the people involved in the project has a track on how well the project is doing and has a clear cut idea on what inputs they should share. SlideBazaar also has an extensive collection of premium and free PowerPoint templates that can suit any idea that the user has. Our designers make sure that each template is unique and that you will be able to create stunning templates to impress your audience.